Merk Insights - Is Your Portfolio for Ready for 2015? Is Your Portfolio Ready for 2015? #crash? Is the recent bout in volatility yet another ‘buy-the-dip’ opportunity or a sign of worse to come? Investors struggle to both keeping up with the markets while protecting themselves against a severe correction. By taking a step back, investors might be able to see the forest for the trees to gauge whether their portfolio is ready for what lies ahead. •	The good: Risky assets have done very well in recent years. •	The bad: Portfolios may be overweight in risky assets, making them vulnerable in a market correction. In fact, as defensive assets underperformed, odds are that tax-loss selling further skewed the portfolio towards risky assets. •	The ugly: Risk-free assets, if there is such a thing, to rebalance to, don’t look so pretty either. Risky assets are typically equities, but also junk bonds, MLP investments – just about anything that tends to do well when markets are “in a good mood” which often associated with low volatility. 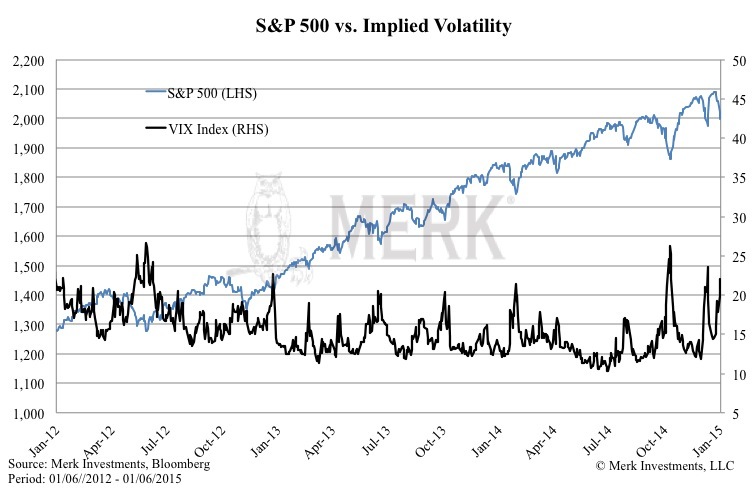 We have repeatedly cautioned in the past, that an uptick in volatility could derail these markets, i.e. as fear comes back, asset prices may be re-priced lower. In recent years, however, whenever volatility ticked up, it’s been a “buying opportunity.” As this bonanza has continued for so long, anyone taking a more defensive position than the market has quite likely under-performed. Our experience suggests that many investors don’t mind losing more than the market in a downturn, but they can’t bear the idea of not keeping up in a bull market. Investors can listen to pundits who preach the markets will always go up; or reconsider what diversification was supposed to be all about. You may want to do some soul searching whether you are comfortable with the risk profile of your portfolio. Most notably, are you comfortable with the risk profile of your portfolio should volatility move higher? How would your overall portfolio react if the stock market tumbled 25%? You don’t think it can happen? In 2013, the S&P was up over 30%; what can go up can also go down. Could you stomach a major correction? We are increasingly asked how to continue participating in the bull market yet have protection on the downside for extreme events. Differently said, is it possible to have one’s cake and eat it too? In some ways, the answer is yes, but there’s a cost. And once the cost is taken into consideration, one may want to weigh the much simpler alternative – that is, to take chips off the table; except, of course, that in an era of financial repression it’s not all that straightforward anymore. To gain downside protection, investors could consider some form of insurance. To gain such insurance, some firms sell structured products; keep in mind that these might also incorporate counterparty risk, i.e. the insurance is only as good as the issuer. As long as the issuer is “too big to fail” investors may not be concerned about this. Although note that the very reason one buys such insurance is to hedge against extreme risks. •	The more volatile the environment is. So it’s cheaper to protect against a 25% market correction over the next month than over the next year; it’s cheaper to protect against a 25% market correction than against a 10% correction; and it’s cheaper to buy protection when volatility (perceived risk) is low. If you put the numbers together, even in a low volatility environment, it can cost 4%-5% annually to protect an equity portfolio against a 15%-20% correction. Keep in mind that you ought to be happiest if this protection expires worthless. As equity markets have moved about 20% per annum in recent years, you might be willing to give up a quarter of the gain. But history shows that 20% annual gains for the S&P are not normal. Are you really willing to give up 5% of your return if the S&P returns only 6% a couple of years in a row? And are you willing to give up 5% per annum if the S&P has minor, but not catastrophic down years where you lose both on the S&P, as well as on the cost of the insurance? Did I mention that the cost of buying protection might move up considerably during more volatile periods? Paying for downside protection Not surprisingly, many that look at ways to protect their portfolio on the downside, start thinking about revenue sources to pay for it. Writing covered call options is sometimes cited, a strategy that may generate income in a sideways market. Let me emphasize that this is not investment advice, as it should be clear that such strategies should only be pursued if one either understands them well or has the guidance of an expert who does. There other possibilities – each coming with their own set of risks. For example, investors might want to consider a currency overlay as an alpha generating strategy to help pay for the protection. We may be able to offer a solution to family offices or institutional investors (please contact us if you like more information); however, for most individual investors this isn’t an option as they can’t simply whip up a currency overlay. So why again are investors looking for protection? It’s because the risky portion of their portfolio has grown. There may be a simple alternative: rebalance the portfolio, shifting to less risky assets. Unfortunately, here’s the next challenge: what asset is “less risky” these days? •	Cash. Cash is boring. In an era of negative real interest rates, cash is certain to rob investors of their purchasing power. As such, we don’t call cash risk free anymore. However, cash is indeed at the lower end of the risk spectrum. •	Bonds. Historically, bonds perform this function. In fact bonds have done extraordinarily well. But many not-so-risky assets might be masking risks. The idea of rebalancing into bonds, only to see bonds plunge may not be all that appealing. •	Uncorrelated strategies. Without giving a specific investment recommendation, any investment that has a low correlation to one’s existing assets is worth considering, as long as one has a positive return expectation. The proof will be in the pudding, as in an “extreme” market, many strategies may not be that uncorrelated after all; neither will their volatility be necessarily low. These strategies are generally lumped into ‘alternatives’: the best selling “alternatives” – many Master Limited Partnerships (MLPs) investing in oil and gas ventures have taken a tumble as energy prices have plunged. Managers of long/short equity strategies might not be able to short stocks in an extreme environment. As our long-term readers know, we are comfortable with long/short currency strategies as such strategies have fewer liquidity constraints often associated with volatile markets. And then there is gold that has historically shown to have low correlation to other markets. Each one of these choices has their own distinct risk profile investors should study carefully. To dive more into this topic, as well as our 2015 outlook, please register to join us on Thursday, January 22, 2015, for our Merk Webinar. In the meantime, follow me on Twitter at twitter.com/AxelMerk for my most up-to-date thoughts on the dollar, currencies and gold. If you haven’t done so, also make sure you sign up for Merk Insights to receive analyses like this one straight to your mailbox.